From the little-known islands of the north to the southern city of Galle, this tour captures the essence of Sri Lanka and takes in seven of the country’s eight UNESCO World Heritage Sites. Visiting the north of the island while it still has few tourists was a privilege and greatly interesting and enjoyable. It was an authentic experience and to be encouraged for anyone who is not afraid to go off the beaten track a bit. The palm-fringed shores of Sri Lanka have attracted travellers for centuries, drawn to the islands’ natural treasures and extensive cultural heritage. For a small island Sri Lanka has incredible diversity: idyllic white-sand beaches, mangrove lagoons, mysterious mist-swathed hill country and rainforest rich in wildlife. On this comprehensive tour you will see many of Sri Lanka’s most significant cultural and natural sights including: the ‘must see’ ancient ruined cities of Mihintale, Anuradhapura and Polonnaruwa, the fascinating northern town of Jaffna, the rock fortress of Sigiriya and the remarkable cave temples in Dambulla. Moving south to the cooler southern heartlands, surrounded by tea plantations and mountains, you arrive at the cultural centre of Kandy and continuing further south to the coast the tour concludes in the fascinating, fortified UNESCO town of Galle. Meal arrangements: All meals from dinner on day 2 to breakfast on day 16. Fly to Colombo. Drive to Ranweli. Forest walk. Drive to Wilpattu. Game drive in Wilpattu National Park. Tour of Anuradhapura and Mihintale. Drive to Jaffna. Explore Jaffna. Visit Nainativu Island. Return to Jaffna and tour fort. Drive to Trincomalee. Visit Fort Frederick. Drive to Polonnaruwa. Visit ruined city. Climb Sigiriya. Drive to Kandy. Tea Plantation visit and Temple of the Tooth. Drive to Galle - guided tour. Whale watching (Nov-Apr). Drive to Colombo. City tour by bus. Fly to London. Day 2 - Arrive Colombo. Group transfer to Ranweli. Evening lagoon boat trip. You will be met on arrival in Colombo before making the short drive north to Waikkal. Just outside the village, and set between the sea, a lagoon and two rivers, lies the unique Ranweli Holiday Village. The final part of your journey to the hotel will be a short passenger ferry across the river. Once you have checked in you will be free to relax and enjoy the facilities of the hotel and their lovely grounds. In the evening there will be a sunset boat trip around the lagoons. Day 3 - Guided forest walk - 2-3 hours. Drive to Wilpattu. This morning you can take a two hour guided walk through the mangrove to learn more about the flora and fauna. There are a myriad of spices and plants whose uses will be explained to you by an enthusiastic and knowledgeable guide as you stroll around the gardens and along wooden walkways through the mangrove swamps. The area is home to 130 species of birds, some of which you may be able to spot, and nine species of amphibians including the water monitor lizard. Later you will start your journey to the north of the country. This afternoon you drive to Wilpattu National Park area and your hotel for the night which is a short drive from the park itself. Once you have left the busy area around the coast the roads become quieter and there is much to see from the vehicle as you go along. Day 4 - Early morning game drive. Tour of Anuradhapura. Early in the morning, whilst it is still cool, you will drive to the entrance gate of the park to board your safari vehicle and embark on a morning's game drive. Wilpattu is Sri Lanka's largest and oldest national park with an area of 130,000 hectares. It has only recently been reopened after several decades of closure due to the armed conflict in the country. There are relatively few visitors at the moment, especially compared to Yala in the south, meaning less vehicles and thus less crowding when a sighting occurs. The main draw are leopard and sloth bear sightings but there are also many other mammals, birds and reptiles to feast your eyes on. A unique feature of Wilpattu National Park is that the entire park is dotted with large sand rimmed natural lakes known as 'villus'. The villus collect rain water and tend to attract wildlife especially during the times of drought. After the game drive you will return to your hotel for a late breakfast before setting off on the short drive to Anuradhapura and its ancient city. Established in the 4th century BC, Anuradhapura was Sri Lanka's first capital and remained so for many hundreds of years. After a turbulent period, the city was largely abandoned in the late 10th century and over subsequent years its palaces and monasteries were reclaimed by thick jungle. Now a World Heritage Site, Anuradhapura once again enjoys both historic and religious status. The location of the city was originally determined by the planting of a cutting from the 'tree of enlightenment' (the famous fig tree of Buddha) and today the area is a major attraction for visiting Buddhists. This afternoon you will visit the principal sights including the Sacred City and of course the Sri Maha Bodhi Tree. After the tour you will return to your hotel for the night. Day 5 - Morning tour of Mihintale. Drive to Jaffna. Just a few minutes' drive from Anuradhapura is the sacred mountain of Mihintale. It was here in 247 BC that Buddhism was first introduced to Sri Lanka - King Devanampiya Tissa was converted to the faith by the visiting son of the Indian Buddhist emperor Ashoka. This morning you'll take a walk to see some of the temples and shrines that adorn the slopes of the mountain. The summit is reached by a climb of around 1,840 stone steps and offers great views of the surrounding countryside. It is best to go early before it gets too hot for this climb, although a lot of it is shaded to some degree. Once at the site you are required to remove your shoes to walk around inside. This is on sand and rock and can be very hot underfoot if the sun is shining. It can be a good idea to wear socks to protect your feet for this visit. After lunch you will drive north to Jaffna, a journey which takes around 3 - 4 hours. Jaffna is the biggest town in northern Sri Lanka and has a real Indian feel to it being closer to the Indian state of Tamil Nadu than Colombo. This is evident in its culture with a predominance of Hindu temples and the sounds of Tamil being spoken, instead of Sinhala. From 1983 to 2009 the entire region was engulfed in the civil war, the impact of which is all too evident, with ruined homes, bombed churches, and buildings pockmarked by bullets. Around one in five of the city's structures suffered war damage. The city is surprisingly green and leafy, with attractive palm-shaded colonial-era suburbs and beautiful temples and churches. The centre however is busy with traffic congested streets, cyclists weaving around and cows block the roads. There is a local market place selling everything you might need and also historic buildings juxtaposed with new building work. Depending on your arrival time you might take a walk around some of the quieter suburban streets around your hotel or venture into the centre to watch the world go by. Once home to many old British cars you can still see the occasional Austin A30, Morris Oxford, Morris Minor and Austin Cambridge in various states of repair on the streets of the town. Day 6 - Explore Jaffna town and peninsula. After breakfast you will have a tour of the main sites of the town including the small archaeology museum, situated in an attractive old building and displaying a selection of statues and artefacts from the area. A few kilometres from the centre is the magnificent Nallur Kandaswamy Temple, Jaffna's most notable sight and the most impressive Hindu temple in the country, rivalling the great shrines of India. The complex is enclosed within red and white striped walls and there is a steady stream of visitors especially for the six daily pujas. As with most temples shoes must be left at the gate to the complex and men must remove their shirts to enter the temple itself. Further out of the town on the peninsula passing through rural scenery you come across the dagobas of Kantharodai in a very peaceful, rural setting. This curious archaeological site, dating back at least 2,000 years, consists of 56 (so far excavated) miniature dagobas crowded onto a small plot. No one can quite explain the exact purpose although the popular theory is that the dagobas contain the remains of some 60 Buddhist monks killed here. Continuing to the north of the peninsula you will arrive at the Buddhist beachside temple of Dambakola Patuna. A serene and peaceful location housing a brilliant white temple, it is said to be the place where Theri Sangamitta is believed to have landed, bringing the sacred Bo tree Sapling to Sri Lanka. Returning to town you can explore the market area, old library, clock tower and perhaps stroll around the small park area by the causeway. Day 7 - Trip to Nainativu Island. Return to Jaffna and visit fort. An early start is needed today to drive over the causeway out of Jaffna towards the islands straggling out into the waters of the Palk Strait. You will pass fishing nets and numerous wading birds in the shallow waters and the road, which starts with a good surface, soon deteriorates the further from Jaffna you get. Passing small villages, Hindu temples, cyclists and cows, ruined houses, boats and palm trees, Buddhist shrines, colourful buses and boys playing cricket on bits of scrub land you drive across the islands watching life going on. After crossing another causeway you reach the island of Punkudutivu before arriving at the tiny, busy jetty where you will board a small public ferry for the short crossing to the island of Nainativu, home to two important religious shrines. The island itself is only about 4km long and barely a kilometre wide, but despite its diminutive size it is an important pilgrimage site for both Hindus and Buddhists. The crossing takes only 15-20 minutes and as you approach the island you will see the huge multi coloured Hindu temple - Naga Pooshani Ambal Kovil, sacred to the goddess Ambal and where new-born babies are brought to receive a blessing. A 10 minute walk along the coast from here is the Buddhist temple of Nagadeepa Vihara which marks the spot of the Buddha's second visit to Sri Lanka. Both these temples receive many pilgrims especially on the 'poya' or full moon days when the island becomes very busy with visitors. You will visit both temples and take a walk to explore around the quiet streets of the island. A return ferry will take you back to your waiting vehicle for the return drive back to Jaffna. In the early evening, as the temperatures drop and the sun sets, you will visit the old Dutch Fort situated by the coast. This is the largest Dutch fortress in Asia and was built on the same site as the former Portuguese stronghold. It is built in the characteristic star shape as favoured by the Dutch, the idea being that the pointed bastions offered greater protection against hostile cannon fire. Completed in 1792 it was surrendered to the British just four years later and after 200 years without action it was finally pressed into military service during the civil war. The once battered fort is now being restored and there is a small visitor display upon entering. You can wander around on the walls and enjoy the views of the Jaffna lagoon. Day 8 - Drive to Trincomalee via Elephant Pass and Kilinochchi. Visit Fort Frederick. Departing Jaffna you will take the road heading east and after about an hour will cross over Elephant Pass, a place known for two major battles fought here in 1991 and 2000 during the civil war and where there is now a memorial to the war and its victors. Further along the road you come to Kilinochchi a small town which served as headquarters for the Tamil Tigers. The town was largely destroyed in 2008-9 during the fighting and siege and is now re-built leaving a huge ruined water tower as a reminder of the devastation brought about by war. Continuing south the road takes you past a real mixture of images including lagoons, tropical vegetation, villages, ruined houses riddled with bullet holes, cycles and trucks laden with produce, children in spotless uniforms going to school, markets, multi coloured temples, small towns with shops lining the roads spilling their wares onto the pavements and many birds of all types and colours. Trincomalee has been known since antiquity for its deep water harbour, one of the best in Asia, serving as the main port during the Anaradhapura and Polonnaruwan periods and later used by all the colonial powers. The town itself, which suffered during the war, has a largely Tamil population and a distinct Indian feel. On arrival you will be driven to your beach side hotel where you can take some time to settle in before an early evening excursion to Fort Frederick. The beaches here on the east coast, Nilaveli and Uppuveli, form a long strip of gorgeous sand with low level hotel development along them together with local fishermen going about their business hauling in their nets to inspect the daily catch. The further north you go from Trincomalee (or Trinco as it is known for short) the less development and the emptier the beaches. This coastline is still relatively unspoilt and a great place to relax for a few days. As the day cools down you will drive the short distance into town and to the old Fort Frederick whose buildings spread across the narrow peninsula jutting out into the sea east of the town. It has a mottled history, originally built by the Portuguese, then captured by the Dutch, then the British, the French, back to the British, the Dutch and finally the British again! You can walk up through the Fort past military buildings and numerous stalls selling various souvenirs to Koneswaram Kovil, the large Hindu shrine dedicated to Shiva situated at the end of the peninsula and where you can witness regular puja ceremonies. Next to the shrine is 'Lovers Leap' the highest point on Swami Rock, a towering clifftop view point where trees cling to the rocks adorned with prayer flags. Day 9 - Morning - Whale watching (May-Oct); Time at leisure (Nov-Apr). Afternoon - walk to Velgam Vihara. For departures between May and October: In the morning you can join a whale watching excursion or opt to take a boat trip to Pigeon Island for snorkelling (not included). Sri Lankan coastal waters are rich in nutrients and therefore sea life, as a result of the heavy inflow of river waters during the monsoon rains. Many of the waters lie on the migratory path of the whales and conditions are ideal for whale watching. As well as the giant blue whale and sperm whales, dolphins are also commonly seen. If these do not appeal then the morning is free to relax further at the hotel or on the beach. For November to April departures: The morning will be at leisure. The afternoon walk is a great opportunity for bird watching and you will spot numerous species along the way. There are many houses around here with plaques noting that they were re-built, post war, with various funds from NGOs. Arriving at the ancient Buddhist site of Velgam Vihara there is a small visitor centre with a short video about the site. Next to the centre you should find a tiny tea stall selling herbal tea and small bits of jaggery - a form of unrefined sugar from palm tree sap - which you can sample. The temple itself dates from the Anuradhapura period and has four entrances with ruined stupas and statues. It was abandoned when the capital moved from Anuradhapura in the 10th century and was lost into the jungle until it was re-discovered in the 18th century. Nearby is a large lake (tank) which has much bird life and where you can stroll around its shores along a shady path. Leaving the coast you will drive south to the old capital of Polonnaruwa which will take 2-3 hours. Polonnaruwa is the ruined 12th century capital of Sri Lanka, and beautifully set on the man-made Parakramabahu Samudra. Before exploring the ruins, you will visit the modern museum which gives an excellent insight into the history of the old city. The highpoint for many visitors to Polonnaruwa is the Gal Vihara (Stone Shrine). Four Buddha statues have been carved from the same huge slab of rock and originally were part of a monastery complex. The reclining Buddha is 14 metres long and supremely ethereal. It is one of the most famous sights in Sri Lanka. After lunch your leader will take you on a gentle countryside walk, a great opportunity to observe day to day life in rural Sri Lanka. The predominant activity here is Chaina cultivation (slash & burn farming). This involves villagers cutting and then burning patches of jungle to create clearings for short-term cultivation of crops, such as rice and vegetables. Water is a precious resource here so farming operations are kept small scale with farmers typically only working two or three small plots at any one time. On your walk you will doubtless see numerous wooden tree-houses where villagers take it in turns to stay up at night keeping watch over their crops, lest they fall prey to wild elephants or other animals. Day 11 - Early morning climb of Sigiriya. Visit Dambulla caves. Drive to Kandy (approx. 4 hours). An early start is needed to climb the giant rock of Sigiriya before the heat and crowds become too much. The citadel at Sigiriya rose to importance in the 5th century AD when Prince Kassapa murdered his father, the King and built a castle on top of Sigiriya Rock in anticipation of the backlash against him. 500 years later the site was abandoned, and was largely forgotten until rediscovery by the British in 1828. The rock is a World Heritage site and is much visited by tourists. It is worth arriving at the site early to walk through the peaceful water gardens to the start of the climb up the main rock. The walkway up the rock is astonishing and the rock is covered in notches and grooves cut for alternative routes to the top. From the summit the jungle extends seemingly endlessly in all directions. This afternoon you will visit Dambulla, famous for its remarkable cave temples. The caves are a steep 15 minute climb up from the road and are cut out of a huge natural granite outcrop. It is thought that the caves may have been inhabited from prehistoric times, and now the five caves are full of beautiful statues and carvings. The rock offers magnificent views of the surrounding countryside across the plains. You now drive to Kandy, the last bastion of independent Sri Lanka before it fell to the British in the 19th century. The city has distinctive Sinhalese culture and architecture. Day 12 - Visit a tea plantation and the Temple of the Tooth. This morning you will drive up into the surrounding hills to visit a tea plantation. Tea estates dot the southern highland area, they were developed by the British in the early 19th century and became a big industry for Sri Lanka. You will be able to see how tea is produced and walk around the plantation to view the tea bushes and enjoy the beautiful scenery. Returning to Kandy you will visit the much revered and very holy Buddhist shrine - The Temple of the Tooth. Said to have been brought to Sri Lanka over 2,000 years ago in the hair of a Princess, the tooth is the island's most important Buddhist relic housed in a temple dating from 1687, situated on the lakeside. Day 13 - Drive to Galle for a late afternoon tour of the town. This morning you will drive to Galle (4-5 hours) which is Sri Lanka's best preserved town. The old colonial streets contained within the fort have been lovingly restored, many with their original street facing verandas and red tiled roofs and are interspersed with imposing churches and other colonial buildings. The fort ramparts are virtually complete and a stroll along them is a great way to see the town and get a sense of its size and position. This fortified Portuguese/Dutch port is now a UNESCO World Heritage Site and a popular spot for visiting tourists. Within the old low rise, Dutch period villas you will find many shops, as well as cafes, bars, small hotels and guesthouses. You will doubtless be tempted to pick up some nice souvenirs or presents to take home. Day 14 - Free time in Galle or optional whale watching (Nov-Apr). In recent years Sri Lanka has developed a reputation as one of the best places in the world to view both blue whales and sperm whales. The prime spots are offshore from Dondra Head or Mirissa, both of which are just a short drive from Galle. It will be an early start today to join a whale watching boat tour (on November to April departures). As well as the giant blue whale and sperm whales, dolphins are also commonly seen and you will hopefully enjoy several sightings of these impressive marine creatues. You will return to shore in time for lunch with the remainder of the day at leisure. If you prefer not to head out to sea, the day is yours to relax and soak up the ambience in one of the lovely cafes or restaurants in town, do some shopping or explore further the old town buildings and museums. On departures between May and October the whole day will be at leisure in Galle. Day 15 - Drive to Colombo. Guided tour. Today you will drive into Colombo and have a guided tour by bus of the main sights. You will be staying at the city's most famous hotel - Galle Face. Situated on the oceanfront it is slightly quirky and has lots of character. In the afternoon you can stroll up the seafront promenade beside Galle Face Green where a small night market sets up selling snacks and where you can watch the locals and tourists alike taking a turn. Day 16 - Group transfer to airport. Fly Colombo to London. After breakfast you will be transferred to the airport, a drive of around an hour, for your flight home. Honestly, they never fail to amaze me with the amount of activities they can tie into one trip! Its hard to write all the amazing things that I experienced into one small review but all I can say if you're thinking about going to Sri Lanka this tour is for you! Hotels were stunning! One even had two floors to it!! Practically an apartment by my opinion! All the people in Sri Lanka are absolutely lovely and the amount of monuments and temples you will be able to see will amaze you! Nothing but gorgeous scenery and delicious smelling food! Only downside is I didn't bring enough bug spray! Couldn't recommend it enough either way! 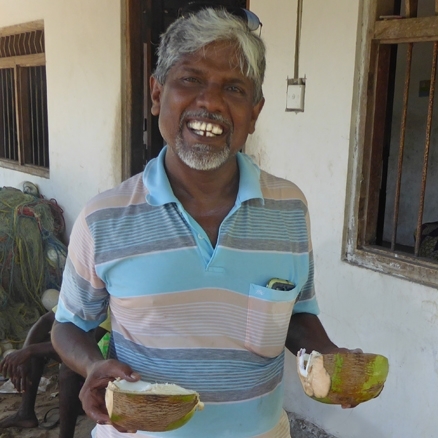 An enjoyable group tour well worth the journey to reach Jaffna and the Palk Strait Islands in the far north, and Trincomalee on the east coast. There were some long drives to the central World Heritage sights and Galle. There was a nice mix of temples, wildlife and colonial experience. The hotels were excellent and up-market, but tended to be somewhat isolated from nearby towns and Sri Lankans.